Paris, France, and Providence, R.I. USA – Dassault Systèmes (DS) (Euronext Paris: #13065, DSY.PA), a world leader in 3D and Product Lifecycle Management (PLM) solutions, today announced the availability of Isight and Fiper 3.5, the first new release of these market-leading simulation process automation and design optimization solutions following SIMULIA’s acquisition of Engineous Software. By using Isight and Fiper, product development engineers are able to integrate cross-disciplinary models and applications together in simulation process flows, automate their execution across distributed compute resources, and explore the resulting design space. These solutions enable manufacturing companies to improve the efficiency of identifying optimal design parameters and accelerate the process of bringing better-performing products to market. Isight 3.5 (formerly known as iSIGHT-FD) is the market-leading, open desktop solution for creating simulation process flows. It interconnects any commercial software—including but not limited to CAD/CAE, Microsoft Excel™, and customer-developed applications—to automate the exploration of design alternatives. Isight includes advanced engineering techniques such as optimization, Design for Six Sigma, approximation methodologies, and Design of Experiments that enable design engineers to optimize designs against key performance parameters. It also provides powerful interactive postprocessing tools allowing engineers to explore the design space from multiple points of view. Fiper, an add-on product to Isight, enables users to share Isight simulation process flows, distribute and parallelize their execution across available compute resources, and share multidisciplinary simulation results. The Fiper add-on can be accessed directly from Isight or from a Web interface. With the new releases of Isight and Fiper 3.5, SIMULIA is delivering on its promise to expand the ecosystem for its open scientific platform. SIMULIA is enabling a rich assortment of components to be developed for use in simulation process flows that connect commercial applications. Customers can use the Isight component software development kit to develop their own components. Third-party component development is now being facilitated through the Dassault Systèmes partner program. * New 64-bit native support improves performance and enables running more complex and larger models. * An advanced search capability in Isight assists in finding any component, parameter, or file in a simulation process flow. * The ability to view contour plots with superimposed constraint violations within the Visual Design Driver. * Enhanced reliability and performance for Distributed Resource Management (DRM) of simulation jobs through the integration of Platform Computing’s Load Sharing Facility (Platform LSF). LEE'S SUMMIT, Mo. : Mid-West CAD Inc., an Autodesk Premier Solutions Provider proudly serving Kansas City and the Mid-states region, is helping unemployed design professionals update and gain additional skills and knowledge with the latest Autodesk design software programs, by providing a 50% price reduction on all training courses offered. This discount is available to anyone currently unemployed due to layoffs, downsizing, and restructuring. Additionally, Mid-West CAD sponsors user groups and events throughout the region which enable industry professionals to try new software, share industry experiences, and network. SANTA ANA, Calif : MSC.Software, a leading global provider of enterprise simulation solutions, including simulation software and services, today announced that Jaguar Land Rover has selected the company's SimEnterprise solutions including MD and SimManager, as well as core engineering products including MSC Nastran and Adams, to optimize their simulation processes. This deal provides Jaguar Land Rover with the core engineering tools for their transition from Ford as well as the foundation for simulating more effectively and efficiently and attaining higher levels of productivity. Under the new agreement, Jaguar Land Rover will implement MSC.Software's solutions at their two main design facilities located in Whitley and Gaydon, as well as at several other production facilities across the UK. Jaguar Land Rover has been a customer of MSC.Software's core products for many years and are pleased to continue this long association. At the same time that the automotive market is becoming increasingly competitive, premium luxury vehicles are becoming increasingly complex and loaded with new technology. Jaguar Land Rover is, therefore, progressing a strategy to make the maximize their use of simulation in the development of its vehicles to ensure these highly complex products can be delivered robustly, with the highest quality and in the most efficient way. The deal with MSC.Software enables the company to utilize MSC.Software's Multi Discipline and SimManager applications to further enhance the company's simulation capability and optimize the simulation process, thus helping Jaguar Land Rover achieve its new product development goals. "It's very exciting to see trends occurring with multiple major automakers taking the path forward with our SimEnterprise solutions," said Bill Weyand, Chief Executive Officer. "Business is extremely competitive for automotive manufacturers and it is a testament to our solutions ROI value when companies see the success of enterprise simulation installations and recognize how their businesses can also be making better products faster and at a lower cost by adopting our solutions." HOUSTON : COADE announced today that COADE CAESAR II for pipe stress analysis has received its Certificate of Compliance from Russian State Standard system certification, effective December 17, 2008. COADE was assisted in the certification process by its COADE Global Network Partner (CGNP) in Russia, EMT-R. The Certification states that CAESAR II conforms to Russian standards as described in normative documents RD 10-249-98, standards of calculations for strength of stationary boilers, vapor and hot water pipelines; CA 03-003-07, for the calculation for strength and vibration of steel technological conduits; and State Standard 14249-89 for vessels and other equipment, including norms and methods of strength calculations. COADE CAESAR II is the world’s most widely used software for pipe stress analysis, used by most major engineering firms and owner-operators of plants and piping facilities. In recent years, COADE has seen rapid growth in Russia and other parts of Eastern Europe for CAESAR II as well as for its other software products, including PVElite for pressure vessel and heat exchanger design and analysis; CADWorx Plant Design Suite for intelligent plant design modeling, process schematics and automatic production of plant design deliverables; and TANK for the design and analysis of oil storage tanks. The company expects continued growth in Russia as its economy expands and invests in its plants and infrastructure. New Delhi : A Design Education Campus of National Institute of Design (NID), Department of Industrial Policy & Promotion, will be set up in Bhopal for imparting education in design, applied research, training, design consultancy services and outreach programmes. The Institute, being set up at the initiative of Shri Kamal Nath, Union Minister of Commerce & Industry, would function from a 12 hectare campus. The NID, Ahmedabad has already taken steps to conduct some fundamental programmes in design in collaboration with Rajiv Gandhi Technological University (RGTU) so as to foster design-technology initiative in Bhopal and help potential students of RGTU to opt Design as High Education Career option when the Institute would start functioning. The NID is one of the premier institutions in the field of design and has been recognized as a scientific and industrial research organisation. It is among the top ranking design schools of Europe and Asia and it was established in 1961 as an autonomous institution under the Government of India. The Industrial Design module will be introduced in June 2010 in the various engineering departments of Rajiv Gandhi Technical University of Bhopal, for getting the overview of industrial design which will help the students from Bachelor of Mechanical engineering, Production engineering and also Electronic Engineering to understand more about Design. A one-year Certificate Programme on design for engineering / technology will commence during June 2010 and further, commencement of 2-year PG programme from June 2011, from new Campus. NEW YORK and SAN RAFAEL, Calif : The first annual sustainable design-trend watch survey jointly commissioned by the American Society of Mechanical Engineers (ASME) and Autodesk found that two-thirds of respondents have worked on designing sustainable products. The survey of ASME members is the first research conducted to understand the factors and impacts of sustainable design on mechanical engineers and their manufacturing businesses in industries including automotive and transportation, industrial machinery, consumer products and energy. Sustainable engineering refers to the design and manufacture of an ever-increasing volume of goods and services while using the earth's resources more efficiently and producing less waste. A key trend highlighted by the survey is that more than half of the practicing engineers responding reported they expect to increase their use of sustainable design practices in the next year. Primary design concerns focused on using less energy, reducing emissions and complying with environmental and regulatory standards. Additionally, a separate survey of ASME student members found that half of the respondents have encountered sustainable design practices in their studies and are extremely interested in green and sustainable information and causes. "Engineers have to understand the impact of their decisions on built and natural systems," said ASME Executive Director Thomas G. Loughlin. "They must be skillful at collaborating closely with colleagues in an increasingly interdisciplinary work environment to meet efficiency and resources goals impacting our only Earth." "ASME is committed to being a strong player in the important discussion among engineers, legislators, and industry -- including suppliers like Autodesk -- to ensure that everyone is pointing in the same direction when it comes to sustainable engineering practices," Loughlin added. "A few years ago our industry may have not been as focused on sustainable design, but these results confirm that designing with sustainability in mind is now a primary aim of mechanical engineers," said Robert "Buzz" Kross, senior vice president, Manufacturing Industry Group at Autodesk. "Autodesk is pleased to join with ASME to highlight the importance of making smarter, more sustainable design decisions. This underscores our continued commitment to providing engineers with the Digital Prototyping tools required to understand the environmental impacts of a new product." Along with creating designs that use less energy, reduce emissions and comply with regulatory standards, respondents also indicated that design priorities include using renewable, recyclable and recycled materials, reducing material waste in manufacturing and improving manufacturing processes to use fewer resources. However, cost is a major consideration when deciding to factor sustainability into developing a new product, according to the survey. One-third of the professional engineer respondents indicated that they would consider sustainable technologies for new products only if they are cost-competitive. The online survey of 50,000 ASME professionals and 18,000 ASME student members was conducted over a two-week period in December 2008. The questionnaire covered 16 questions and generated nearly 3,500 respondents in the U.S. Approximately 60 percent of the practicing engineers responding to the survey have careers spanning more than 20 years, with more than 25 percent focusing on the design and development of products, systems or equipment. Nearly 20 percent of the respondents work in the energy and power industry, and more than 10 percent, respectively, work in professional services and in manufacturing fields. For more information on the ASME/Autodesk Sustainability Survey, visit www.autodesk.com/green. As a leading provider of design innovation software to architects, designers and engineers around the world, the single most important contribution Autodesk makes to sustainability is to provide its customers with the very best design and engineering software -- enabling smarter, more sustainable design decisions. The same Autodesk Digital Prototyping software that manufacturers use to design, visualize, and simulate their ideas can also enable customers to innovate in sustainable ways, such as saving energy and optimizing material use. Digital Prototyping helps manufacturers optimize materials use, decrease or eliminate waste, make sustainable materials choices, optimize energy use, and address a growing number of product-related environmental regulations and voluntary standards worldwide. To learn more about Autodesk commitment to sustainable design, please visit www.autodesk.com/sustainabilityreport. DALLAS--(BUSINESS WIRE)--Worksoft, Inc., a leading provider of solutions that accelerate deployments of SAP® applications, today announced that it will be exhibiting and offering demonstrations of its unique ‘code-free’ approach to business process validation testing with its flagship Worksoft Certify for SAP solution suite at the SAP Insider event, SCM/PLM/Manufacturing/CRM 2009. Worksoft pioneers innovative approaches to software quality testing, and is a premier provider of lifecycle automation solutions for use with SAP® solutions to reduce the total cost of ownership for users. Worksoft’s unique “scriptless” or code-free approach to creating and maintaining test cases speeds the rollout of SAP solutions by up to 60 percent; shortens time-to-value by improving reliability of business processes; and meets compliance, training and reporting requirements through the auto-generation of documentation and capture of reusable business process knowledge. Worksoft's customers include industry leaders in manufacturing, financial services, government, healthcare, retail and transportation. Worksoft was founded in 1998 and has its headquarters in Dallas, Texas. Bangalore : Magma® Design Automation Inc., a provider of chip design software, announced today that QThink® Design Services has added Titan™ Chip Finishing to its Talus®-based design flow to implement next-generation digital and mixed-signal designs. By leveraging Titan’s tight integration with the Talus IC implementation system, Qthink can automate what are traditionally manual, repetitive and time-consuming steps in the chip finishing process, allowing them to provide their customers with shorter development cycles and reduced development costs. In traditional flows, chip finishing -- the point at which the digital and analog blocks of a design are integrated together -- is a time-consuming and manual task. Titan Chip Finishing provides complete and automated chip finishing capabilities. This fast, high-capacity system integrates mixed-signal layout with the Talus place-and-route capabilities. Titan Chip Finishing can manipulate the largest designs with ease, automates analog and special-net routing through an efficient constraints-based approach and makes all mixed-signal layout changes immediately available for physical and timing verification sign-off analysis through a live interface with Talus, Quartz™ DRC and Quartz LVS. Titan Chip Finishing can implement late engineering change orders (ECOs) that affect both analog and standard-cell components without significantly delaying the schedule. New Delhi: solidThinking, Inc. continues to expand globally, adding India-based DesignTech Systems Ltd. as its latest value added reseller (VAR). Known as one of the most user-centric design/styling software programs for industrial designers worldwide, solidThinking is now available to DesignTech Systems customers as part of the company's suite of technology offerings. DesignTech Systems will promote, sell and support solidThinking to customers throughout India. Founded in 1998, Pune-based DesignTech Systems, a leading solutions provider with operations across India, has driven the development and application of the latest IT technologies for customers, including services in design to manufacturing, simulation, software customization and macro programming. "Since the founding of DesignTech Systems, we have aimed to provide our client base with the most enhanced suite of software solutions to fit their product design and development needs," said Vikas Khanvelkar, DesignTech System's managing director and a pioneer of CAD/CAM in India. "We feel solidThinking, with its advanced, yet flexible nature, is a key tool for the industrial design community, and we are pleased to add solidThinking to our suite of software solutions." solidThinking's latest version 7.6 software includes a number of features focused entirely on the needs of the industrial designer, such as an updated rendering engine, simultaneous parameter editing and control-point editing, a streamlined user interface and rich photorealistic-content functionality. Its advanced construction tree encourages users to change their minds anytime during the design process without having to recreate their ideas. solidThinking is not only the first and only industrial design software of its kind to run on both the Windows and Mac OS platforms, but it is also compatible with computer-aided design, manufacturing and engineering (CAD/CAM/CAE) software, aiding collaboration between industrial designers and engineers during the crucial development process without limiting them to traditional constraints. "This partnership marks an important milestone for solidThinking's global distribution efforts," said Jim Hassberger, vice president of business development and customer relations for solidThinking, Inc. "DesignTech Systems' success and reputation throughout India will prove beneficial to our growth efforts, and we are equally confident that solidThinking's offerings will further enhance DesignTech Systems' product suite." Thousands of designers have used solidThinking to develop products and packaging for companies and brands known worldwide, and it has been instrumental to many of the world's leading designers of furniture, electronic devices, automobiles, lighting, shoes, jewelry, timepieces, sports equipment, boating, consumer packaging and more. Delcam is pleased to report that the online forum for its ArtCAM artistic design and manufacturing software (http://forum.artcam.com/) has recently gained its 10,000th member. Over the past six years, almost 35,000 articles, many with multiple postings, have been contributed by the members, covering all aspects of the use of ArtCAM software in applications as diverse as signmaking, furniture manufacture, engraving, woodworking and jewellery production. Items have also been posted on a wide range of related issues, including the selection of materials and equipment. In addition, the site contains around 1,000 examples of models created in ArtCAM. These demonstrate not only the versatility of the software but also the skill and imagination of the users. People that don’t yet use ArtCAM are welcome to visit the site to see the kind of project that can be completed with the software. Recent enhancements to the site include the introduction of RSS feeds to give automatic notification of new information and enhanced security to protect users from spam and other unwanted mail. Delcam’s ArtCAM software makes it easy to produce sophisticated 3D designs from all types of 2D artwork, even for people that are not usually strong in technical subjects. It enables people with creative flair, such as artists, designers and engravers, to increase their productivity and raise quality by using computerised manufacturing techniques, alongside their traditional skills. CAMARILLO, Calif : Surfware, Inc., developer of SURFCAM® Velocity CAD/CAM systems Powered by TrueMill®, today announced the opening of the Surfware Demo and Training Center in Camarillo, California. This state-of-the-art facility will serve many functions. It will be a multi-media center where live demonstrations of TrueMill and SURFCAM will be filmed and made available on the Surfware website, YouTube and other communication outlets. The facility will host live webcasts, where people around the country and the world can view real-time demonstrations of using TrueMill for the high speed cutting of titanium on a Haas machine. The Center will also serve as a R&D site where additional research on the vast potential of the TrueMil technology will take place. The results of this research will benefit the machining industry worldwide. Finally, to ensure that visitors to the Demo Center feel at home, the facility is a bright, well-appointed and comfortable place to visit. RESEARCH TRIANGLE PARK, N.C : Geomagic has launched Geomagic Labs, a community website that provides early access to new technologies, innovation and product concepts before they appear in commercial software. Geomagic Labs can be accessed at: http://labs.geomagic.com/. * GeoAutoMate – a utility that improves productivity by monitoring a directory, automatically loading input files into Geomagic Studio or Geomagic Qualify, and executing a user-defined macro. * MakumDatum – a program that provides drag-and-drop automation for creating datum points in Geomagic Studio and Geomagic Qualify. * American Board of Orthodontics (ABO) Base Add-On – a new feature that enables the creation of digital orthodontic models for case presentation, model storage and rapid prototyping. NEEDHAM, Mass : PTC® (Nasdaq: PMTC), The Product Development Company®, today announced that Deuce Snowboards is using PTC CoCreate® to design and launch a new category of snowboard, the multi-edge snowboard. CoCreate, PTC’s explicit 3D CAD software enabled the company to develop and launch the revolutionary, multi-edge snowboard while also keeping the upfront product development costs as low as possible. Finding a snowboard design that would allow boarders to experience the same stability and performance benefits of two-board skiing quickly led Todd Belt, executive manager at Deuce Snowboards to an innovative design idea for a new multi-edge snowboard. In order to support the production and innovation process of this new board prototype, Belt realized he would need to create multiple virtual 3D CAD prototypes. This ability would be fundamental to the product’s success because it would enable design adjustments without the expense of developing costly physical prototypes for each adaptation. When evaluating software design systems, Belt placed strong emphasis on user friendliness and the flexibility to quickly design product prototypes that incorporate feedback during the extensive field testing. Deuce Snowboards selected CoCreate explicit modeling software because it addressed that criteria as well as proving to be a natural fit with Belt’s innovation process, one of exploring and learning through continuous improvement and design modification. The multi-edge snowboard launch faced continuous and unpredictable changes through the design process. This is where CoCreate delivered a second, key advantage for Deuce Snowboard—software that dynamically evolves product designs in response to unexpected changes and new information throughout the innovation process. In short, an intuitive design tool that enabled adjustments based on engineering analysis or results from field testing. MARLTON, N.J : Acsis, Inc., a leader in track and trace solutions for supply chain safety, security and efficiency, today announced that it will be exhibiting at the upcoming SAP Logistics and Supply Chain Management conference, March 2-5, 2009 in Orlando, Florida. This will be the sixth year Acsis has participated in this event and its first time participating in the SAP Perfect Plant Pavilion. SAP, in collaboration with manufacturing industry solution providers—including Acsis—is creating solutions for synchronized plant operations, giving manufacturers a complete 360-degree view into all of their processes. In the “perfect plant,” executives have visibility into every aspect of manufacturing activities. The individual objectives of the shop floor are precisely aligned with the overall goals of the business. In support of the “perfect plant” initiative, Acsis will take part in the SAP Perfect Plant Pavilion. In addition, the company will have its own booth #315 where it will demonstrate the latest in track and trace technologies, including its newest Shipment Execution Optimization solution. Acsis has more than 11 years of experience providing companies shop-floor-to-top-floor visibility into their SAP operations. Acsis helps organizations gain a stronger connection with core SAP business applications, improve efficiencies, attain faster time-to-value, reduce implementation windows and improve daily operations. SAP Logistics and Supply Chain Management is the event for organizations that run, support and are evaluating SAP® solutions for procurement, logistics, planning, transportation, supplier, inventory and warehouse management. The event is co-located with PLM 2009, Manufacturing 2009, and CRM 2009. For more information on Acsis, visit the Perfect Plant Pavilion or booth #315 of the Solutions Showcase or visit www.acsisinc.com. WESTMINSTER, CO - TransMagic Inc., the leading developer of precise, easy-to-use multi-CAD data exchange software, today announced that Superlift Suspension Systems has integrated TransMagic into its design process. Superlift is leveraging the power and flexibility of TransMagic software to exchange 3D data between differing computer-aided-design (CAD) systems and relied on TransMagic to complete products for the 2008 SEMA show. Using TransMagic, designers visually select, automatically repair and group the needed portions of 3D CAD data from automotive OEMs before importing into SolidWorks. Superlift engineers use the improved data to more efficiently create new product designs. "TransMagic has made it possible to open any neutral or native CAD file we receive, quickly isolate, repair and retrieve what we need," said Kevin Dill, Product Development Lead Engineer, Superlift. "Repairing damaged files and grouping what we need prior to importing has saved us lots of time. Our time is now better spent working with clean, manageable files that we can rely on as we design new products." "TransMagic makes a big difference for our customers by allowing them access to CAD files from multiple sources for use in their preferred 3D application," said Todd Reade, President of TransMagic. "By integrating our unique all-in-one data exchange application into the design process, customers can quickly improve productivity and get their products to market faster." Superlift has reduced reverse engineering processes and file re-creation by integrating TransMagic. Quality is also improved since new product designs are based on original OEM data rather than measurements taken in the field. TransMagic reduces the costs of translating, repairing and repurposing 3D CAD files to any design and manufacturing applications. Visit www.transmagic.com for a free trial. CCE announced today that it has added several key capabilities in the latest update of EnSuite version 2.2for people in Manufacturing Support and Supply Chain job functions. EnSuite’s latest release provides access to Product Manufacturing Information (PMI) stored in annotated 3D models. This type of information, typically required by manufacturers & fabricators, include geometric dimensions, tolerances, surface roughness, datums, etc. and are collectively referred to as Product Manufacturing Information (PMI). Most of the major CAD systems provide tools for annotating parts or assemblies with PMI but often name it differently. For example, CATIA V5 uses 'Functional Tolerance Annotation' (FTA), CATIA V4 uses "Geometric Dimensioning and Tolerance" (GD&T) while Siemens’ Unigraphics NX uses PMI. By providing PMI data, EnSuite helps manufacturers improve collaboration throughout the supply chain by providing accurate product specifications, enable increased usage of 3D product information throughout the product lifecycle, dramatically reduce design and fabrication errors caused by the misinterpretation of 2D data or paper documents, not to mention shave off paper handling and document delivery costs. The latest EnSuite update also includes a new Shrink Wrap tool that can be used to combine all the solid bodies available in an assembly file to a single solid. The result would provide an accurate external representation of the model. This model can be shared with people, where sharing the detailed information of the design is not required. This is especially useful in a supply chain environment to reduce the detail of production data for intellectual property protection as also to create simplified data for complex purchased assemblies. EnSuite supports files from multiple CAD formats including latest software versions including CATIA V5 R19, SolidWorks 2009 and NX6 among others. EnSuite is designed to provide quick access to critical engineering information residing in CAD data, no matter which CAD system was used to author it. Its extremely user-friendly interface is designed with non-designers in mind. The latest EnSuite update will be available to all active subscription license customers as well as to new customers. For additional information, or to view demo videos, please visit www.cadcam-e.com/EnSuite2. HUNTSVILLE, Ala : After realizing an approximately 30 percent increase in design speed during a pilot project, ORLEN Projekt SA, one of the largest design and engineering firms in Poland, has upgraded to SmartPlant 3D design solution and expanded its use of Intergraph(R) SmartPlant(R) Enterprise's engineering software, adding additional SmartPlant 2D modules and data integration. Specializing in plant design for the refinery, petrochemical and chemical industries, ORLEN Projekt obtained results for the Claus sulphur recovery unit that have so far proven to speed the design process by approximately 30 percent using SmartPlant 3D design tools. While working on the live project, the company had the confidence to implement additional SmartPlant Enterprise solutions, seeking improvement of overall productivity by another 20 percent. These include instrumentation, P&ID, electrical, reference data, and enterprise data management solutions. The new software was put into production after less than three months of training. "After just a few months working with the project, we realized the system helps us speed the design process by approximately 30 percent using new 3D design tools," said Wlodzimierz Garwacki, technical director at ORLEN Projekt. "We expect to further improve productivity by an additional 20 percent, integrating the design applications and control the documentation of design data exchange," he added. Gerhard Sallinger, Intergraph Process, Power & Marine president, said, "ORLEN Projekt's successful implementation of SmartPlant Enterprise is yet another example of the value and benefits our solutions provide to EPCs in the chemical and refining industries. With a single integrated environment across all disciplines, the company's project quality and productivity have measurably increased resulting in accelerated projects and cost savings." Intergraph's SmartPlant Enterprise offers a powerful portfolio of best-in-class plant automation applications. These applications may be deployed individually or as a flexible, integrated enterprise solution, leveraging success-critical project information and knowledge to improve and automate work processes, from the very early project phases through plant operations and maintenance up to decommissioning. According to ARC Advisory Group's recent Process Engineering Tools Worldwide Outlook Market Analysis and Forecast through 2013, Intergraph ranks first overall in process engineering tools and for the chemical and refining industries as well as 3D engineering design. SANTA CLARA, Calif : Berkeley Design Automation Inc., provider of the Analog FastSPICE™ unified circuit verification platform for advanced analog and RF integrated circuits (ICs), today announced that MIPS Technologies, Inc. (NasdaqGS: MIPS - News), a leading provider of industry-standard architectures, processors and analog IP, has selected the company's Analog FastSPICE™ unified verification platform including the AFS Nano SPICE simulator for analog/mixed-signal IP verification and characterization. Analog FastSPICE is the industry’s only unified circuit verification platform for analog, mixed-signal, and RF design. Always delivering true SPICE accurate results, it provides 5x-10x higher performance than traditional SPICE, >1 million-element capacity, and the industry’s only comprehensive noise analysis. The AFS Platform is a single executable that uses advanced algorithms and numerical analysis to rapidly solve the full-circuit matrix and original device equations without any shortcuts. AFS Platform tools include: AFS Nano SPICE simulator, Analog FastSPICE circuit simulator, Noise Analysis Option™ device noise analyzer, and RF FastSPICE™ multi-tone periodic analyzer. "We are excited that MIPS Technologies selected Analog FastSPICE for their analog/mixed-signal IP verification flow," said Ravi Subramanian, president and CEO of Berkeley Design Automation. "Delivering an advanced and extensive analog/mixed-signal IP portfolio is a tremendous challenge. MIPS Technologies' selection of Berkeley Design Automation tools further validates the strong competitive advantage our Precision Circuit Analysis technology provides to leading-edge analog/mixed-signal IP designers." EnginSoft, Italy's leading service provider in CAE and Virtual Prototyping technologies, announced an important milestone in the development of its network of regional offices with the launch of EnginSoft UK Ltd. This new company will represent the interests of EnginSoft in the UK, including the provision of technical and sales support for the modeFRONTIER software package. With its network of expert engineers at branch & partner offices and subsidiaries in various countries, EnginSoft represents one of the major players in the field of simulation in Europe and the US. ”The creation of EnginSoft UK Ltd will ensure the best possible local support for our customers, and further improve their access to our expert teams across Europe” affirmed Stefano Odorizzi, CEO and President of EnginSoft. The senior team of the new office will be led by Managing Director Bipin Patel, who has spent more than 20 years in Business Development, Sales and Marketing and Engineering. Working with him will be Steve Lucas as Operations Director and David Moseley as Technical Director. Between them the team have extensive expertise in optimisation and process integration as well as implicit and explicit finite element and multibody analysis in the automotive and aerospace sectors. The team also includes experts in client specialisms and IT. Alongside its support to EnginSoft's UK customers, the new office further strengthens the existing network of EnginSoft experts worldwide. “This is an exciting time for everyone at EnginSoft, as we now have a dedicated business solely focused on our customers in the UK. Although newly-established as a company, EnginSoft UK staff have over 60 years of cumulative experience in helping companies to be more productive through CAE, process integration and design optimisation solutions” says Stefano Odorizzi. EnginSoft worldwide is built on an authoritative depth of technical knowledge and expertise. It is a key participant in many local and European research projects across several engineering disciplines, and the multidisciplinary nature of its technical skills qualifies EnginSoft as a preferred single partner for many companies seeking expertise in CAE and virtual prototyping, both in the use of commercial software and the development of tailored solutions. From this background, EnginSoft UK is well-equipped to offer a range of services in CAE and virtual prototyping through both in-house and proprietary packages. A particular strength is the implementation of solutions based on the modeFRONTIER multi-objective design optimisation package. These services include customization, turn-key installations and consultancy, supported by the necessary technical backup and training. “Central to the modeFRONTIER development process are the ideas generated through close liaison with our customers, and the presence of our new UK office will ensure the best possible UK participation in these plans, and their effective roll-out. Design optimisation through CAE is an increasingly important discipline, and the EnginSoft UK Ltd’s talented technical team of enthusiastic and experienced engineers are fully-dedicated to this community and to finding better ways of serving you” concludes Stefano Odorizzi. CAMPBELL, Calif : Building on its leadership in functional qualification, Certess™, Inc., today announced Certitude™ -C, the next generation of its functional qualification software product for companies developing SoCs or integrating intellectual property (IP) blocks using C. Certitude-C adds support for ANSI C to the capabilities of the original product, allowing functional qualification of both reference models and high-level representations of designs written in C. This results in qualification of the verification environment earlier and more efficiently than was previously possible. Identifying bugs and other issues at the C level decreases both the time and cost of eliminating them, resulting in faster design times and lower overall costs. Certitude-C is the industry’s first design tool to offer C-level functional qualification. Code coverage is available for C-written reference models, but it only determines whether the code has been executed. Similarly, in the design verification flow for high-level or architectural synthesis, equivalency checking can be used to ascertain if the RTL (Register Transfer Level) code generated is the same as the C model, but not whether bugs could exist in the model and remain undetected by either C or RTL verification. Certitude-C functional qualification can help rapidly find and correct weaknesses in functional verification, allowing functional bugs in ANSI C models to be found, and it can be used to objectively measure the quality of the verification of IP blocks written in C for high-level synthesis. This complements the qualification using RTL code, which is only available later in the design flow and runs more slowly. The availability of functional qualification for C models that can be compiled and run directly on a computer dramatically boosts the ability of the designer and verification engineer to ensure that the desired functionality has been properly verified. Certitude-C is currently being integrated for reference model qualification at STMicroelectronics, and is used in conjunction with the leading high-level synthesis flows, such as Synfora’s PICO Extreme™ and Mentor Graphics’ Catapult® C Synthesis. It has demonstrated significant benefits in terms of earlier and faster functional qualification. WATERLOO, ON : Open Text (NASDAQ: OTEX, TSX: OTC), a global leader in Enterprise Content Management (ECM), today announced the immediate availability of Exceed onDemand(R) 7, an application delivery platform that allows organizations to centrally distribute UNIX applications to local or remote Windows and Linux workstations. Open Text's newest connectivity solution, Exceed onDemand 7 is built on the company's innovative Thin X Protocol(TM) and helps to provide up to 90 percent reduction in network traffic. It enables the deployment of graphically complex applications to users who reside thousands of miles away from the data center. The new version of Exceed onDemand features a number of major improvements that further empower customers to consolidate their IT infrastructure and reduce the operational cost of their UNIX applications. Exceed onDemand is currently being used by more than 100,000 people around the world for a variety of applications such as CAD/CAM engineering, Electronic Design Automation (EDA), aeronautical engineering, financial and statistical applications, geological exploration and scientific research. "In these times of economic uncertainty, Exceed onDemand can offer a quick return on investment to companies that rely on UNIX applications," said Eugene Cherny, General Manager for Open Text's connectivity solutions. "It helps customers to reduce the number of application centers and replace expensive proprietary workstations, while enabling real-time team collaboration." New York, NY: OptiTex, the leader in CAD/CAM design software for the cut-fabrics industries announces the anticipated release of their leading software in Arabic. With customers in countries such as Tunisia, Kuwait, Egypt and Saudi Arabia, OptiTex is pleased to reach out to Arabic speakers in the textile industry worldwide by expanding their leading software to the Arab market. OptiTex is the leader in 3D CAD for fashion and all cut-fabric industries. Its user-friendly features and fully customizable interface make it the software of choice for leading designers such as Tommy Hilfiger, Hugo Boss and Zorana Kozomara. “The expansion of OptiTex to serve Arabic speaker’s world wide provides key opportunities for those in the Arabic textile industry. We are very excited for this opportunity to extend our reach to new distributors and further geographical coverage of the OptiTex software.” states Yoram Burg, OptiTex USA President. By developing tools and expanding the OptiTex software into more languages, OptiTex succeeds in giving industry customers the opportunity to improve their fashion and textile businesses and increase ROI. In addition to Arabic, OptiTex software functions in more than 20 languages including English, French, Spanish and Chinese. 1)Considering your rich and long term association with the CAD CAM industry could you please briefly explain the main mile stones in its development till now, the current scenario and the future expectations. In order to be short: I focus only on the geometric modeling aspects (CAGD) and on commercial products. I do not consider UI and hardware evolutions except for the future. We can distinguish three aspects of CAGD evolutions, time-ordered: what, how, why. Each aspect has its own evolution. * What: it covers what the model represents and the tools to generate the model. Direct modeling is its representative. * How: it covers how the model is generated and modified (the various evolution steps of the model). Parametric and variational are the representatives with their recent improvement i.e. the synchronous technology. * Why: it covers why a model is generated or modified i.e. the rationale and the target of a design. Target driven design is its representative. * How: it is the so-called parametric (middle 80’ in France but not really industrial and robust thus no success, late 80’ in US) and features (late 80’ in US), history-based, variational (early 90’ in US), synchronous technology (second half of 00’ in US). * Why: it covers the capture of why a design is made. Note that it can coexist with what and how. It encompasses designer’s intent and target driven design (TDD) (late 90’ in France) including analysis and production targets. Design for emotion (middle of 00’ in Europe) and “kansei” engineering (middle 00’ in Japan) criteria once embedded in TDD should allow the combination between qualitative and quantitative targets. * Multi-modal UI, actual virtual 3D workstations (hologram, vocal command and sound feedback, effective haptic, probably EEG). Hence easier to handle CA-x tools. * More and more intelligence in models (self-adaptive). * An equilibrium between parametric, direct and target driven modeling methods. * A new model representation (due to the limitation of Real number floating point limitation limitations) with new mathematics thus a new set of CAGD tools. 2)Can you give some insights into the new R&D work going on at think3? * To compensate any production process that changes the designed shape and in particular stamping spring-back, shrinking and thermal wrapping for casting or plastic injection. o Noisy measured STL from physical models either for the first generation or to update the CAD with modifications made on the physical model. o Quick CAS generated shapes. * To enhance the GSM tool by adding shape constraints. 3)Historically, it is always the large companies that first benefit from new technology. But in the case of think3, can small and medium companies see a beacon of hope? Yes, especially considering the current W-W crisis! SMEs can win the global competitiveness and overcome the general crisis through innovation and new technologies. think3 specifically meets the needs of small to mid-sized companies. Our solutions have been developed listening to their requests and are easy to use and learn, with streamlined procedures and high productivity tools. Our aim is offering to SMEs scalable solutions, assuring fast implementation and fast ROI. We believe that in times of economic turbulence we have to provide more value to our customers and SMEs have to maintain or increase investment in ‘good costs’, i.e. innovation and new technologies. Innovating through Recession is the way to overcome economic turbulence. 4)In a global economy that is reeling under cost pressures, what is the role that think3 may seek to play to offer competitive advantages to its customers? We provide at a reasonable cost tools that once adopted in the customer process lead to huge gains. Gains of more than 90% can be measured. 5)In what way do Think3's India operations contribute to R&D / Innovation activities of Think3? We have around 100 people in Indian R&D. These people are a key part of our global R&D organization. Some functionality that is requested by large international OEM's in the aerospace or automotive sector is developed in part or totally by this team. In the future this team might become more and more strategic as the competency levels increase. 6)Do you see an untapped potential in Indian design engineers to further expand R&D activities in India? 7)Could you please tell us about the innovative product offerings of Think3? o Target Driven Design tools: 1D-2D tension, target curvature plot. * Vocal commands (unfortunately not yet so used, thus a lack of tuning). 8)Will this work when we have to design complex assemblies with several sub-assemblies, each with many components? Can many people work simultaneously on a medium to large project? It depends on what is the definition of “complexity” and “many”. 9)Which are the prime target industries of think3 solutions? The manufacturing industry is our prime target. 10)Can we identify the key differentiators with competing products in the CAD / CAE market space? * Integration of 2D, 3D and PLM. * Parametric (locally optional) and direct modeling. * COM components available API. 11)Does your product have integrated document management tools? Is it possible to customize think3 to automate customer design requirements? Yes (PLM) and yes (SO, COM API). Moreover think3 proposes the TD PLM family of product life cycle management applications. It is a simple, effective way for managing information, processes and human resources. * Orders during sales activities. * Product Maintenance and the management of spare parts and customer assistance. 12)Can you export or import files and models from other popular CAD / CAM tools? In fact design and CAD integration is a key point for us and our customers: the continuously increasing pressure to shorten product development, determine the importance of accessing and using design information from any of your CAD system (in your or supplier/customer sites) in a form that enables it to be distributed and used not only in engineering but also by all departments across your and the “extended” enterprise. The 3rd millennium product development process revolves around heterogeneous designs and associated data – making changes, controlling those changes, and communicating their information throughout the company is the new challenge. 13)What are the other 'value adds' that think3 might bring to a customer table - like consulting, for instance? Yes, we can perform consulting, PLM - PSO customization, shared research projects (AR&D) within a formal partnership. 14)Does think3 promote customer interaction through conferences and events? Yes, we did it for instance by a paper on compensation written in common with PCI that we presented at a China conference (2002), with HONDA cars where they presented their gains on design quality and time during an Italian conference (Bolzano, 2006) and we continue by contributing to a presentation BMW (in March this year) on compensation. In addition, during 2009 the Company is going to launch important initiatives to increase Customer Intimacy and collaboration: the CAP (Customer Advisory Program) a table of top international customers that will seat with our R&D with the purpose of sharing views and orient together and according to Market’s demand our future development. Also we will revamp our beta testing community with a project called Quality Accelerator that will wide the number of beta testers in the world. 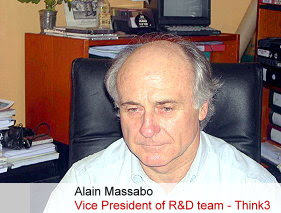 Alain Massabo began his career in 1972 in the research and development of computer aided design, manufacturing and analysis tools (CAD/CAM/CAA). In his remarkable career, he’s introduced shape design tools and technologies, initiated several European projects like FIORES-I and FIORES-II (as coordinator), Touch & Design (TnD), SATIN (ongoing) and, Mr.Massabo’s done it all without looking back. He has an expertise in implementation of international projects, patenting and servicing. His success is unrivalled and is the embodiment of good old-fashioned hard work and team spirit. He has successfully managed to maintain a positive relationship with suppliers, research laboratories, universities and University commission. He’s skilled in management of high level teams & various unions. In his remarkable career, he has been a member of the IMS (Intelligent Manufacturing System) expert group and one of the founders of French CAD/CAM associations. He has been an Invited speaker for the 80 years celebration of Professor Pierre BEZIER (one of the CAD/CAM pioneers in the world). PUNE - INCAT, a Tata Technologies company and a global leader in Engineering Services Outsourcing (ESO) and Product Development IT services, today announced that the Company's worldwide work force has surpassed 4,000 employees. INCAT employees work throughout India and the Asia-Pacific region, Europe, and North America, providing engineering, design and enterprise solutions in SAP and Sibel CRM systems, as well as other consultancy services to the world's most ambitious automotive and aerospace manufacturers and their suppliers. "Our organization has realized unprecedented growth within the past two years," said Milind Kaulgud, Head of HR -- INCAT Asia-Pacific, who coordinates HR operations and initiatives worldwide. "To match the growth of our client portfolio, we have expanded our professional services delivery network by adding more than 1,100 employees in North America, Europe, and India during that period." The Asia-Pacific region has seen the highest growth in employment for the Company, according to Kaulgud, but the INCAT ESO value proposition requires robust staffing in all regions. In North America, where the automotive industry is seeing its greatest stress and downsizing, INCAT is focusing on retraining automotive engineering professionals to put their knowledge and experience to work in other industries, including aerospace. INCAT delivers its training with i get it®, its proprietary, Web-based tool for knowledge management. In Michigan, the location of the Company's North American headquarters, INCAT is a licensed training provider through the MichWorks "No Worker Left Behind" program, an initiative of the State of Michigan, and is currently offering a cross-training program for displaced automotive designers seeking to apply their skills to aerospace design. INCAT also participates in the MichWorks "Incumbent Worker Program," for companies seeking to retrain their current work force in new engineering and design software applications, to avoid downsizing, secure new projects and increase productivity. "INCAT has established a leadership position worldwide for engineering professionals who seek opportunities for both personal growth and career development," Kaulgud added. "We have become an aspirational organization, attracting and retaining the industry's very best professionals by creating an environment that offers challenge, values individual skills, puts the latest technologies into the hands of our engineers, and fosters performance excellence." INCAT, founded in 1989, is a Tata Technologies company. The company is a global leader in Engineering Services Outsourcing (ESO) and Product Development IT Services to the global manufacturing industry. INCAT, through its pragmatic approach to engineering and manufacturing processes and its unique-in-the-industry Global Delivery Model, delivers best-in-class solutions for Product Lifecycle Management (PLM), Enterprise Resource Management (ERM) and Application Development and Maintenance (ADM) to the world's leading automotive and aerospace manufacturers and their suppliers. INCAT is headquartered in the United States (Novi, Michigan), India (Pune) and the UK (Luton). Tata Technologies is headquartered in Singapore. INCAT has a combined global work force of more than 4,000 employees serving clients worldwide from facilities in North America, Europe and the Asia-Pacific region. SAN RAFAEL, Calif - Autodesk, Inc. (Nasdaq: ADSK - News) has launched Autodesk Softimage 7.5 software for visual effects and game production. With this release, Autodesk has renamed the SOFTIMAGE|XSI software -- acquired from Avid Technology, Inc. -- Autodesk Softimage. The 7.5 version offers timesaving new features, such as UV unfolding technology, a multithreaded Syflex cloth simulator and an integrated mental ray 3.7+ renderer. Artists have used Softimage to create numerous movies, commercials and video games, including the Oscar-winning film "Happy Feet," Coca Cola's "Heist" Super Bowl ad, and the "Fable II" video game. "Our mission at Autodesk is to deliver integrated pipelines for digital entertainment creation and Softimage is an important addition to our portfolio," said Marc Petit, Autodesk Media & Entertainment senior vice president. "It has been three months since we acquired substantially all of the assets of Softimage and its integration into Autodesk is going extremely well. The team has kept Softimage 7.5 on plan and it has shipped without delay. We remain committed to delivering solid future releases of the software." UV Unfolding Technology: Softimage now features UV unfolding technology that enables artists to unwrap polygon models with just a few clicks. This technology works well on complex organic models, which would be difficult to unwrap manually. Softimage 7.5 also provides UV editing tools that help artists quickly create and edit UV maps. mental ray 3.7+: Version 3.7+ of the mental ray renderer is now integrated into Softimage 7.5. Highlights include improvements to binary space partitioning for faster render times, multiple final gathering refinement passes and new motion-based displacement. These enhancements help users create high-fidelity images faster than ever before. Multithreaded Syflex Cloth Simulator: The production-proven cloth simulator in Softimage is now multithreaded, enabling artists to use the cores on their machine to iterate faster. Scene Compatibility with Version 7.0: Scenes saved in Softimage 7.5 will load into Softimage 7.0. For more information about Autodesk Softimage 7.5, visit http://www.autodesk.com/softimage. Version 7.5 of Autodesk Softimage (formerly SOFTIMAGE|XSI Essentials) and Autodesk Softimage Advanced (formerly SOFTIMAGE|XSI Advanced) are now available. The Autodesk suggested retail price for Softimage 7.5 (Windows) is US$2,995* and $4,695* for Softimage Advanced 7.5 (Windows)*. SOFTIMAGE|XSI 7.0 customers with active Softimage maintenance contracts will be migrated to Autodesk Softimage 7.5 with Autodesk Subscription. Autodesk Subscription is available for purchase with the product license purchase or upgrade. The Autodesk suggested retail price for Autodesk Subscription is $795* per year for Softimage and $1,235* per year for Softimage Advanced*. Until April 15, 2009, existing SOFTIMAGE|XSI Essentials and Advanced customers, not on Softimage maintenance, can receive up to 50 percent discount and no back-subscription fees when migrating to Autodesk Softimage 7.5 with Autodesk Subscription. ** This offer is available only through Autodesk Value Added Resellers. Locate a reseller at www.autodesk.com/reseller. * International pricing may vary. ** Conditions apply. International pricing may vary. Autodesk reserves the right to cancel, suspend or modify part of this promotion at any time without notice, for any reason, in its sole discretion. CONCORD, Mass : Homeowners and small businesses throughout the U.K. are using micro wind turbines designed in SolidWorks ® 3D CAD software by Windsave, Ltd. to cut their energy costs while reducing their carbon footprint. The Scottish company is also using SolidWorks Simulation Professional to improve overall performance and efficiency. Windsave standardized on SolidWorks to refine the technology and accelerate development of its wall-mounted micro-wind turbine system to reduce the amount of power a home or business draws from the national electricity grid. * Founded in 2002 in Glasgow, Windsave is the largest micro wind turbine installer in the U.K. and at the forefront of a movement to bring green energy choices to consumers. * The micro wind turbine stands just over three meters (nearly 10 feet) tall with a bladespan of 1.7 meters (5.5 feet) and is attached to a building. * As wind spins the blades, the turbine generates electricity that supplements the incoming electricity from the grid, reducing the amount the customer has to pay for, and decreasing overall carbon emissions. * Windsave has reduced the number of prototypes to test new products or features from four to one, saving up to £3,000 ($4,400), using SolidWorks and SolidWorks Simulation. * The company has also reduced the prototype production and testing process from eight weeks to two. * As the company expands sales internationally in 2009, Mike Lumsdaine and his team will explore the possibility of mounting smaller versions of the micro turbines on street lights so municipalities can cut energy costs. * The Global Wind Energy Council predicts that the global wind market will grow by over 155 percent to reach 240 gigawatts (GW) of total installed capacity by 2012. * The amount of wind energy produced globally will represent nearly three percent of global electricity consumption by 2012, according to a Global Wind Energy Council report. * More than one third of European Union electricity must come from renewable resources by 2020, according to the recently signed Renewable Energy Directive. Wind power will account for most of that renewable energy. Mike Lumsdaine, mechanical engineer at Windsave said "With SolidWorks and SolidWorks Simulation, we've been able to refine the action of the tailfin so that it is more efficient and aerodynamic. Additionally, prototyping costs and time kept adding up with Pro/ENGINEER. SolidWorks and SolidWorks Simulation allow us to produce and test a sample on screen to see if we've over- or under-engineered it. That's a huge benefit when optimizing a design." Windsave relies on authorized SolidWorks reseller Thom Microsystems for ongoing software training, implementation, and support. Windsave Ltd., established in 2002, is a dynamic Scottish company within the Renewable Energy sector. We are focused on developing micro generation solutions for domestic and commercial properties. The Windsave System is a small wind turbine generator system, which uses low wind speeds to create electricity. The Windsave System uses our unique technology, which generates electricity supplementary to the national grid supply, reducing reliance on traditional energy sources; benefiting the environment, and helping to lower domestic electricity bills and CO2 emissions. For more information, visit the Web site (www.windsave.com). Thom Micro Systems Ltd. (TMS) was formed in 1981 to help organizations make the most out of their IT investments. During the last 24 years, TMS computer systems have dramatically improved companies' design, manufacture, sales, administration, accounting, and information management processes. TMS is a SolidWorks supplier dedicated to providing the intensive and ongoing support that is crucial to obtaining the maximum return for customers' CAD investments. For more details, visit www.thom-micro.com. NEEDHAM, Mass - PTC (Nasdaq: PMTC), The Product Development Company®, today announced that Vaillant Group, a leading internationally operating heating, ventilation and air-conditioning technology concern headquartered in Germany, has successfully implemented Windchill® as its global platform for product development content and process management. With Windchill, Vaillant Group has reached an important milestone by creating an efficient enterprise-wide product development system formed to increase process transparency and collaboration thus driving product innovation. In the mid 90's, Vaillant Group standardized on Pro/ENGINEER®, PTC's parametric CAD/CAE/CAM software for designing innovative products. Vaillant Group originally used PTC Pro/INTRALINK®, for Pro/ENGINEER data management, but has since upgraded to Windchill to take advantage of its broad and deep capabilities for content and process management as well as its superior Pro/ENGINEER data management capabilities. The implementation of Windchill creates a single, integral platform for global collaboration among the R&D departments across Europe and China as well as controlled access to product development for non-engineering departments and third party suppliers. As part of the project, the PTC Global Service Organization migrated 1.6 million product data files with a total system downtime of less than two days. Like many organizations, Vaillant Group is faced with some extreme product development challenges including increasing competition from overseas companies as well as higher prices for raw materials that are critical for the production of its products. In fact, the more than 130 year-old, family-owned company has a long-term growth strategy to create a competitive edge through innovation and execution of a clear R&D strategy by highly qualified engineering teams. Vaillant Group's R&D centers in Europe and China form one of the largest development teams in the industry. Around 70 percent of heating technology sales are achieved with products less than three years old. Accordingly, the company is investing significantly in research and development (64 million Euro in 2007) in order to safeguard its ability to respond quickly and efficiently to customers' requirements in product development. The PTC product development system is an integral component of Vaillant Group's R&D strategy with Pro/ENGINEER supporting the general development and, in particular, the development of technologies based on renewable energies. Solar thermal systems, photovoltaics, heat pumps and ventilation with heat recovery, all being designed in Pro/ENGINEER, have shown tremendous success with sales increased by 25 percent in this product segment. The newly developed heat pump proved to be an even stronger growth driver with a 40 percent sales increase. Additionally, Vaillant Group is making strides with the development of fuel cell heating appliances. These efficient, environmentally-friendly, hydrogen-fuelled combined heat and power (CHP) units generate 50 percent less CO2 and consume about 25 percent less primary energy. In order to continue to drive its competitive advantages, Vaillant Group keeps improving efficiency. In fact, the implementation of Windchill is one more milestone in optimizing development processes and driving innovation. With the implementation of Windchill, the Vaillant Group established global 3D CAD file access, control and visualization as well as improved collaboration between R&D and non-engineering departments. Furthermore, PTC enabled controlled, online 3D CAD data exchange with suppliers and established design workflows to enable repeatable and predictable product development processes. "One of the greatest challenges for product development in the next few years will be how to share the right information with the right people at the right time. Engineering and non-engineering departments need to collaborate on a global scale and independently of the software system that created the original data. We are convinced that PTC products will help us overcome this challenge in the future," said Dr. Gamal Lashin, head of R&D tools and standardization, Vaillant Group. "To unlock business value by deploying PLM technology, you need to have the right processes in place and full management support through to each individual user," said Josh Fredberg, senior vice president market and strategy, PTC. "Customers like the fact that our out-of-the-box solutions can meet their requirements without customization so that they can focus their services investments on process optimization and user adoption to ensure that they realize the maximum value from their software investments." Vaillant Group is an internationally operating heating, ventilation and air-conditioning technology concern based in Remscheid, Germany. As one of the world's market and technology leaders, the company develops and produces tailor-made products, systems and services for domestic comfort. The product portfolio ranges from efficient heating appliances based on customary fuels to system solutions for using regenerative energy sources. In financial year 2007 the company, which has been family-owned since its founding in 1874, achieved with almost 12,400 employees sales totalling about € 2.4 billion. Delcam will be showing its latest developments for the machining and inspection of composites at the JEC exhibition to be held in Paris from 24th to 26th March. These will include the new releases of its PowerMILL machining software for high-speed and five-axis machining and of the PowerINSPECT inspection software, plus a range of adaptive machining solutions to allow more accurate manufacture of composite components. PowerMILL is used by many composites manufacturers for the production of master models, moulds, jigs and fixtures, as well as for the trimming and drilling of components. The latest release offers a more complete solution for complex machining operations, together with more control for experienced machinists that know exactly how they wish to machine a particular part. The program also includes a range of enhancements to existing functionality to enable both faster programming and faster machining. Version 5 of Delcam's PowerINSPECT software includes support for five-axis scanning with Renishaw's REVO probe. This new release of the world's most successful hardware-independent inspection software also features the ability to use multiple alignments within parts or assemblies, additional GD&T features, more flexible best-fit algorithms, improved CMM connectivity and more versatile report generation. Delcam will also demonstrate new ways in which machining and inspection can be integrated to give adaptive machining. One example of this integration is electronic fixturing. With this technique, toolpaths are adjusted to match the actual position of the surface of the workpiece, rather than trying to align the part into exactly the nominal position specified in the CAM system. It can overcome the problems caused when machining large, flexible composite panels. The first stage in this approach is to create a probing sequence in the inspection software, preferably using off-line programming so there is no interruption to the machine tool's cutting time. This sequence is used to collect a series of points from the workpiece, which can be used map the surface of the part. Any mismatch can then be calculated between the nominal position used in the CAM system to generate the toolpaths and the actual position of the workpiece surface in relation to the machine-tool bed. A modified set of toolpaths can then be created within the CAM system. This approach can ensure that any pockets cut into the surface of a composite part will be in the correct positions. Similarly, by using a map of the actual surface, the user can ensure that any holes and counter-bores are drilled to the correct depth, relative to that surface. Another problem in the machining of composites is that the materials tend to relax as the composite fibers are cut. This is not as serious as might be thought since any pockets tend to be undersize and so can be corrected with an extra machining operation. However, the effect is difficult to predict because the fibers will not lie in the same orientation when they are cut. This means that the degree of distortion will vary in different directions. To overcome this problem, the initial machining operation should be followed by an inspection on the machine tool with a probe fitted where the cutting tool would normally be. This shows how much more material needs to be removed and enables the required extra toolpaths to be generated in the company's CAM system. For more complex components, with twenty or more pockets, a further cycle of inspection and machining may well be needed to produce all the dimensions to the required tolerance. However, for subsequent parts in a series, the complete machining sequence can be repeated and the results checked with a final inspection. A similar problem can arise when drilling holes as the relaxation of the surface can alter their final positions. One solution is to use a two-stage drilling operation. The first sequence is done using an under-size drill, typically half of the size required for the final hole. The surface of the part is then scanned and the results used to create a second drilling routine with the correct size of tool. Any distortion of the part will be picked up by the scan and the centers of the second series of holes can be adjusted accordingly. With its release of Mastercam X3, CNC Software, Inc., introduced Feature Based Machining (FBM). FBM eliminates the manual processes involved in identifying features for programming milling and drilling operations on solid parts. By analyzing the part for specific feature types (shapes, size, location of holes, etc), FBM can automatically create the individual toolpaths needed to machine the selected features and intelligently design an effective machining strategy. * Detect all features for the selected FBM toolpath type, based on selection criteria the user defines. The user can then review all of the identified machining features, and selectively modify or remove features from the list before generating toolpaths. * Select the appropriate tools, either from a preferred tools list or from specified libraries. * Create and assign boundaries needed to drive or constrain tools. * Automatically generate all of the toolpaths necessary to machine the features. CD-adapco has announced the opening of two fully serviced offices in Aberdeen and Oslo bringing the number of locations in Europe to eight. These new offices demonstrate CD-adapco's commitment to satisfying the increasing demand for flow thermal and stress software and services in the Oil and Gas industry, and to the Energy Sector as a whole. "Numerical simulation has a key role to play in delivering sustainable future supplies of energy, no matter what their source," says Bill Clark, CD-adapco's Senior VP of Operations. "The recent opening of new offices in Houston, Singapore, Aberdeen and Oslo shows that this organization is fully committed to delivering simulation technology to the Oil and Gas industry." "The new offices give us the opportunity to expand the talented array of people that serve the Scottish and Norwegian markets and the Oil and Gas Industry as a whole," says CD-adapco President and co-founder Steve MacDonald. "The offices will provide state of the art computing facilities and dedicated customer areas for training and technology transfer. We have always prided ourselves on the quality of our people - becoming a CD-adapco customer means more than purchasing world-class software or services; it opens the door to an unrivalled wealth of engineering expertise." JETCAM International s.a.r.l. today announced the opening of JETCAM Italia Srl as a distributor in Italy. The move is in response to continued strong business in the region and the increased interest from Italian aerospace companies, as well the sheet metal industry looking to make savings through investments in software. The offices based in Milan will provide both pre and post sales services, including training and technical support, and will be managed by Maurizio Zinetti. JETCAM Italia Srl will offer the complete range of JETCAM products, including the recently announced JETCAM MRP system. Mike Weber, Managing Director of JETCAM International s.a.r.l. commented; "Despite the economic downturn we are still seeing many companies that see the value in software to reduce their overheads. The Italian market is one of the largest in Europe and therefore demands a more focused approach. Our presence here is important and we will work with new company along with our current business partners in Italy to serve our customers better." Maurizio Zinetti, Managing Director of Jetcam srl, added: "Smart innovation and improved efficiency will drive Italian companies through this challenging time. What we offer is the industry experience and ability to demonstrate real world savings and return on investment that allows companies to make informed decisions based on known certainties. They can clearly see the increased throughput and reductions in time and material waste which more than justifies the cost of the software in a very short timeframe." JETCAM Italia Srl will operate alongside JETCAM's other distributors and OEMs in the region in the sheet metal cam division, and it will also concentrate on JETCAM's MRP, COMPOSITE and AEROSPACE products. For contact information on Jetcam Italia srl see also www.jetcam.it . Wessling – At EuroMold 2008, the main attraction for visitors at the OPEN MIND exhibition stands was the company's efficient 5axis milling strategies and time-saving automatic functions for 2.5D programming. In addition to considerable interest in the newly released hyperMILL® 2009.1 CAM software, OPEN MIND also experienced brisk demand for the completely automated programming system hyperDENT®, a solution for the dental sector. Visitors from medium-sized and large businesses at EuroMold 2008 were extremely positive about the new functions introduced in hyperMILL® 2009.1. Visitors at the OPEN MIND exhibition stands were primarily interested in how the CAM systems on offer can increase the efficiency of existing process chains. "Customers today expect that short machining times and high process reliability go hand in hand, even with 5axis simultaneous machining of complex parts. The response to the new functions and improvements introduced in hyperMILL® 2009.1 were accordingly positive," says Hagen Rühlich, Technical Director at OPEN MIND. "We especially noticed a strong demand from small run and variant manufacturers, who see their greatest optimisation potential in the programming times for 2.5D milling. The expansions and new developments in hyperMILL®'s intelligent programming strategies and automated functions were particularly well received by this group," says Rühlich. OPEN MIND products were also highly popular among users from the growing dental technology market. For instance, here there was considerable interest in the specialised hyperDENT® CAM solution. Delcam will show its DentCAD and DentMILL dental software at the Lab Day series of events to be held across the USA over the coming months. The series opens with Lab Day Chicago on February 28th. This is followed by Lab Day East in New York on April 18th and Lab Day West in California on May 9th. Delcam's DentCAD is a new computer-aided design (CAD) program that can be used for the fast, reliable creation of dental restorations, including copings, crowns and bridge frameworks, while DentMILL is a knowledge-based machining (CAM) system for the manufacture of components for the industry. While the two programs can be used together to provide a complete design and manufacturing system, both DentCAD and DentMILL are completely 'open' and so can be used with software and hardware from other companies. For example, DentCAD accepts data from any scanner capable of exporting data in the STL format used widely within the dental industry. Similarly, DentMILL can output machining toolpaths to virtually any CNC machine. Most other dental CAM programs are part of a 'closed' system that can only work with unique data formats, or specific scanning or machining equipment. The key benefit of DentCAD is that is extremely easy to use and so is ideally suited both for dental technicians with existing CAD knowledge and those that have no previous experience of computer-aided design. The whole process is based on a series of "Wizards" that guide the user through the entire design process. A wide range of visualisation and analysis tools are available at every stage, including sectioning, measuring, shading and transparency options that allow detailed inspection of the shape being developed. This ensures that the results are exactly as required by the patient. The system is also very flexible, so allowing different design options to be developed and compared. For example, key parameters like the margin line and the cement thickness can be modified and the computer model will automatically update to reflect the changes. In addition, sculpting tools let the user add or subtract material interactively, while the dynamic editing tools allow the complete model to be reshaped quickly and effectively. All the functionality in DentMILL is based on Delcam's PowerMILL CAM system, which is widely acknowledged to be the world leader in high-speed and five-axis machining. This allows the software to offer a far wider range of proven machining strategies than is available in other dental CAM programs. DentMILL first arranges the various components within the block to give the most efficient use of material and then generates the required cutting paths automatically. The latest additions to the software are new five-axis options, which are particularly important for abutment manufacture as these components are difficult to produce with three-axis machining. The new five-axis functionality can reduce material wastage when producing copings and bridges. Previously, all the components needed to be oriented within the material block so that they could all be machined in a single direction. With the five-axis approach, the components can each be rotated to minimise the block thickness required, since the different pieces, or even different areas within a single part, can be machined in different directions. This allows a set of parts to be produced from a thinner block of material so reducing material costs and machining times. Five-axis machining can also be used to machine parts containing undercuts. Another new option is the ability to generate set-up sheets. These allow the user to identify easily multiple parts manufactured in the same block of material.